Goldfinger Law has successfully recovered millions of dollars on behalf of our clients who have been involved in an accident involving public transit such as Toronto Transit, Mississauga Transit, London Transit, Go Transit, Viva, Durham Transit, WheelTrans, Peterborough Transit, Brampton Transit and other Ontario Transit Commissions. Bus drivers, subway drivers and street car drivers are not perfect. They make mistakes. Sometimes these mistakes are caused by negligence, being over-worked, fatigued, exhausted, not caring, or being lazy on the job. These things happen. But the impact of a transit accident can be devastating. It can result in brain injury, lost limbs, broken bones, chronic pain or worse. Our personal injury lawyers have the knowledge and tenacity to get optimal results in these cases. The lawyers for the transit companies do their best to conceal evidence in these cases such as log notes, time entry journals and performance reviews of the drivers. It could be that the driver who caused the accident shouldn’t have been operating a bus on the date of the accident because he was over-worked or had a bad driving record. Goldfinger Law gets to the bottom of these cases to make sure that you get the results which you deserve. When transit accidents happen, the safety and security of a large number of innocent transit passengers is at stake. Goldfinger Law understands that driver error in transit cases puts peoples’ health and lives at stake. Our law firm vigorously fights to on behalf of transit accident victims to ensure that these mistakes do not go unnoticed and unchecked. Other times, transit drivers hit other cars, cyclists, or pedestrians. The size of transit vehicles such as buses and streetcars makes the impact of these collisions significant. The result is that the damages incurred to the party on the receiving end of the collision can be devastating. 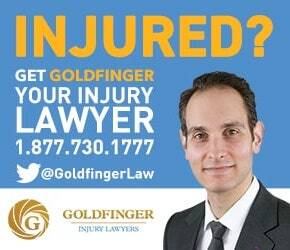 If you or a loved one has been struck by a public transit vehicle, or aboard a transit vehicle when it was involved in an accident, contact the personal injury lawyers of Goldfinger Law today for your free consultation. All of our consultations are free. Get the Goldfinger Guarantee that you won’t pay any legal fees unless we win for you. We don’t get you money, you don’t have to pay any legal fees. It’s that simple and straight forward. 5.0 "Meeting with Brian was the best decision I have ever made"